Calendula, also known as pot Marigold, Holligold, Bull’s Eyes and Gold bloom is a bright face among the Flower Spirits blooming throughout the summer. It also bears the folk name of Summer’s bride because the head of this plant turns as the sun moves through the sky. Needless to say, Calendula has strong Solar symbolism attached to it. In a garden setting Calendula repels insects, which gives it a protective meaning. It’s also an edible petal, so when you want to internalize the energy of Marigolds, you can toss them into salad or soups. The taste is tangy, and the bright color certainly makes a feast for the eyes. Interesting Fact: Healers in the Middle ages carried marigold as a talisman to protect them from the plague. It was also considered highly effective for allaying gossip. In India, Calendula is among the most sacred of flowers. In this setting it represents thankfulness, excellence and serenity. To this day you can find Marigolds adorning holy statues like a living necklace celebrating Nature in all her glory. Lakshmi, the goddess of wealth and Vishnu, her husband and the preserver of the Universe are two Deities that receive these garlands. If you are working with Hindu philosophy, the Calendula is an excellent Flower Spirit to consult for insight. You can also use Marigolds in spells and rituals for prosperity. On a similar note Christians often brought flowers to statues of the Virgin Mary. Thus we have the name Mary’s Gold. This practice aligns Calendula with the Goddess whose love and sheltering blossoms with the sunrise. It’s not surprising to learn that Marigolds were common in love charms and often appeared in wedding decorations because of this association. Calendula flowers have several hues, the most common being yellow and an orange-gold. Both these hues vibrate with the Sun and the energies of joy, abundance, the Third Chakra, intellect, creativity and clarity. 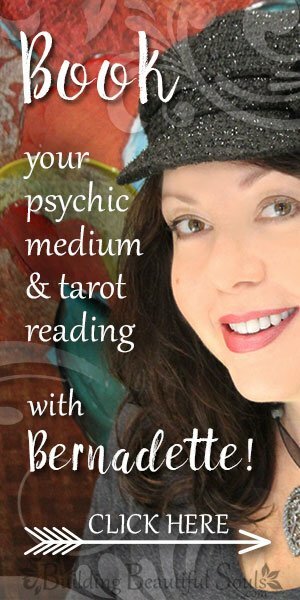 Marigold shares all of these attributes, particularly when working with your Aura. Visualize a Calendula blossoming in the area of your solar plexus to open your personal power for transformation and jump-start your Warrior self. This simple exercise also improves personal energy, joy and well-being. Remember: this chakra is known by the name “Manipura”, which translates as resplendent gem, just as bright and golden as the magical marigold! 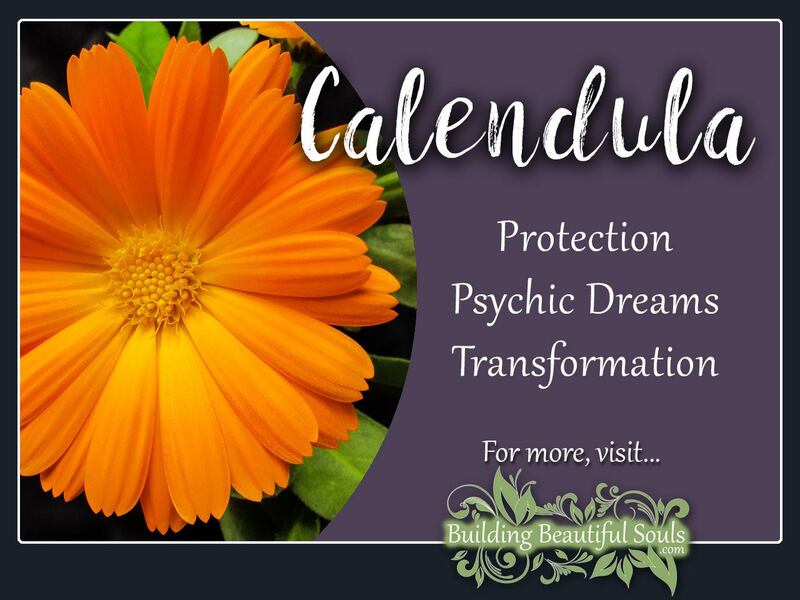 Dreaming of Calendula is generally regarded as a good sign. A meeting of some significance may be in your future – someone that you can trust with an important personal undertaking. It is also sometimes a harbinger of marriage, longevity or prosperity. For more insight into the meaning of Marigolds in dreams, refer to our Dream Dictionary. In the Victorian Flower Oracle, Calendula represents sympathy. It’s depicted with the Scabious and a weeping willow, marking the death of a sweet soul. When the Wheel of Life turns, we often need support – people who understand that even with faith sadness lingers. Here the Marigold offers the light of hope for those left behind – there is no end, just a new season for the soul. The Flower Therapy Oracle Cards give pot Marigold the symbolic value of patience and change along with healing. Something is moving forward. Take a cue from the Calendula and keep your eyes on that horizon … follow the sun but also trust your instincts. The Victorian Language of Flowers designates the Calendula flower are a symbol that says, “I’m thinking of you.” It can also represent disarming gracefulness. The genus name for Calendula (Tagets) comes from an ancient God (Tages) who gave humankind the ability to use divination tools effectively. Herbalists often used dried Calendula flowers as a tea for improving the spirits of someone sad or depressed. In this form it also reduces cramps and fever. Externally a tincture of Calendula or salve cleanses, eases the pain from sprains and itching skin. Overall this power flower offers antifungal, anti-inflammatory, antiseptic and antibacterial qualities. A garland of marigold hung at the entryway of a home protects the house and all therein from evil. For the Calendula to be most powerful in spellcraft you must harvest it in full sunlight. In Numerology Calendula equates to a 4, the number of the Earth and Elemental energies. 4 represents the realization of our potential. In other words 4 brings ideas into reality. This happens when we balance order with instinct, just as the Calendula uses the sun (male) and the association with Mary (female) for manifestation. Calendula had its beginnings in India and Arabia where it had both spiritual and medicinal uses. Often part of the healers kit and that of the home cook, the orange flowered petals appeared nearly everywhere. When introduced to Rome, Marigolds were given to people born in the month of October to celebrate their birthday. At the turn of the 16th century Henry VIII used Calendula as a medicine to prevent Pestilence. For this purpose, his physicians steeped the flower in water for a tea. The King apparently felt that Marigolds granted “god’s grace” for healing (another potential Solar/Sun connection). An Aztec Herbal in the mid-1500 records marigolds for various treatments including curing hiccoughs and as a protective ward to those traveling waterways. The Spanish got Marigold seeds from the Aztecs and cultivated them for monastery gardens. From here, this zealous flower found roots in France and Africa. Nonetheless, their presence remains part of Mexican traditions particularly memorials for beloved ancestors who have passed over. It took some time, but eventually Calendula landed in the New World. David Burpee featured them in the 1915 seed catalogue and fostered the breeding of new varieties. There are several interesting myths surrounding the magical Calendula. One comes from India. It begins with a Deity named Gondmuli. He kidnapped the wife of another God who was determined to get her back. They fought fiercely, and the husband won, dragging his wife back home. As the traveled she dropped a hairpin from which the first Marigold sprouted. Greeks have two stories about Calendula. First is the tale of Caltha and Apollo. Caltha could not keep her eyes away from the Sun god, so much so his powerful rays melted her. What remained was a Marigold which, to this day, keeps its face to the sun. The second bit of lore surrounds Midas, who yearned for great wealth. That was all he cared about but for his daughter named Marigold. Midas wanted Marigold adorned with great riches, but she was content to play barefoot outdoors, crowning her hair with a simple ribbon. One day Bacchus came to visit thanking him for his kindness to Silenus. In the ensuing conversation Bacchus grew uncomfortable without any bit of nature for comfort. Midas said he wanted nothing of such things, but rather wished he could turn everything to gold – a wish that Bacchus granted. Within moments everything on Midas has turned brilliant gold. Marigold came in from the woods with beautiful flowers and wondered about her father’s golden robe and sandals. Midas explained that the Gods had given him the golden touch, demonstrating with his chair and a napkin. Sadly his food turned to gold too! Marigold in concern for her father gave him a hug and likewise turned to gold. He begged Bacchus to spare her, and promised to walk in the woods with Marigold if the Golden Touch would be taken away. Bacchus instructed Midas to wash in the river. There everything on his body returned to normal. He returned to the castle, picking up Marigold in his arms so she too would return to life. Midas and Marigold had a lovely feast, Midas finding that everything tasted grand and looked beautiful in its simple state. The two then went to the woods where Midas found great joy in those walks, far more than any treasure in his coffer. This story reflects the beautiful simplicity of the Calendula and how it too is a sacred treasure.